As Austin continues to rapidly expand, it has become more difficult to strike a balance between the competing interests of its music scene and city residents. To address growing concerns of musicians, clubs and neighborhood associations, the Austin Music Commission presented a plan, known as the Venue Toolbox, to City Council. On February 14, City Council approved the toolbox, four programs designed to improve relationships between music venues and surrounding neighborhoods. “We’re trying to create a good balance between downtown residential density and the live music,” said David Murray, sound technician consultant for the City of Austin Music Division. 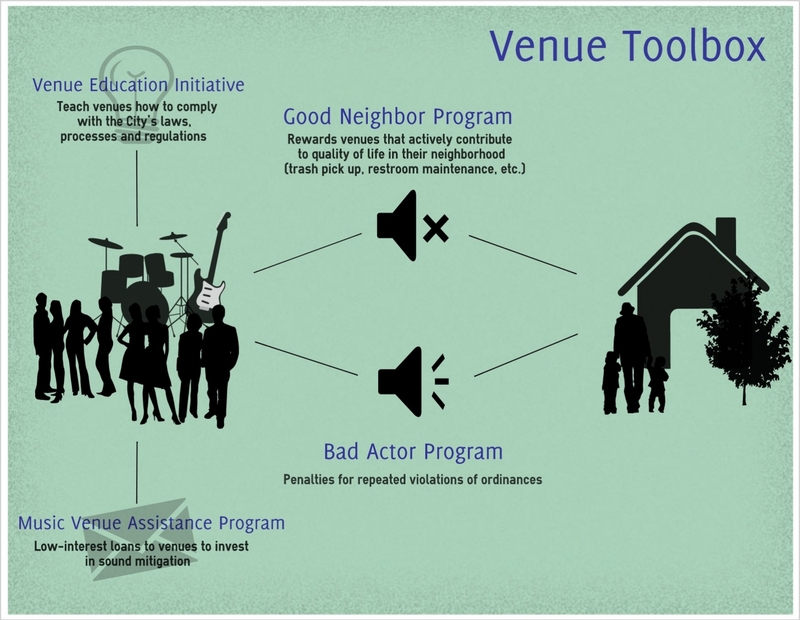 The Venue Toolbox consists of four initiatives: the Good Neighbor Program, which rewards venues for being active contributors to the quality of life in their neighborhoods; the Bad Actor Program, which penalizes venues for violating sound ordinances; the Venue Education Initiative, which aims to educate venues on how to comply with regulations; and the Music Venue Assistance Program, which provides low-interest loans to venues to invest in sound mitigation. According to the City of Austin Music Division, which will lead the effort to create the programs, Austin is home to 270 live music venues. In 2012, there were 2,040 loud music complaints associated with outdoor venues, the majority of which were downtown. In the long run, Murray hopes the toolbox will provide musicians with places to play with fewer complaints from neighbors. “Nothing is perfect. When there’s outdoor sound, I don’t know that you will ever make everyone completely happy,” Murray said. A strong advocate of the Music Venue Assistance Program, which has completed two successful pilot phases, Murray hopes to have the toolbox program “fleshed out and ready” by May. The program provides both technological and architectural solutions that venues could not otherwise afford. Cedar Street Courtyard had received a low number of complaints in its 16 years of operating downtown. With new downtown development, it received more than 300 complaints in one year, despite complying with sound ordinances. The venue was called upon to participate in the pilot phase of the Music Venue Assistance Program and has since seen about a 90 percent drop in the number of complaints it has received. Jason Schnurr, operating partner of Cedar Street Courtyard, is pleased with the success of the city’s proposed solution to sound conflicts. “It seems like it’s worked so far. Our complaints have dropped noticeably. In fact, we hardly hear of any. Also, the sound environment in our venue has changed, too. It’s noticeably enhanced and different in a better way,” Schnurr said. While Schnurr believes the city is taking a step in the right direction to help live music venues close to large scale development, he is unsure how successful it will be in dealing with neighborhood associations who are less willing to provide funding. Jennifer Houlihan, executive director of Austin Music People, believes that the Venue Toolbox, and more specifically, the Good Neighbor Program, will allow those involved in the music scene to have more control over its direction. “The advantage is that it puts the fate of each venue and in a larger context, the music industry, in the hands of musicians and the club owners rather than exclusively a neighborhood association,” Houlihan said. Austin Music People, as the voice of Austin’s music scene, had a direct influence in the creation of the toolbox. It invites necessary dialogue between neighborhood associations and club owners, Houlihan said. Joshua Leasure, an architectural acoustics consultant in Austin, hopes to see the programs applied effectively. He stresses the necessity of a carefully constructed education program so that venues are taught the most accurate information from a variety of experts. He also hopes that there will be concrete requirements for how money from the Venue Assistance Program can be spent based on real data. Murray says that through the venue toolbox, the city is trying to satisfy competing interests as best as they can, where everyone’s needs are met. “What some of these bars have found when they start programming their spaces accordingly and making changes is that neighbors who were contentious in the past actually become their patrons. And that’s something we want to see more of,” Murray said.